The Skin Cancer Foundation recommends window tint as part of a comprehensive sun protection program. This recommendation often comes as a surprise because most people think only of outdoor sun safety when they think of skin cancer prevention. While wearing sunscreen, covering up and staying in the shade are all keys to helping protect against the sun’s Ultraviolet Rays (UV) while outside, you should consider a more complete approach to prevention that includes protecting yourself and your family while indoors, especially on the road. High performance window tint offers all day skin protection which helps prevent skin cancer. 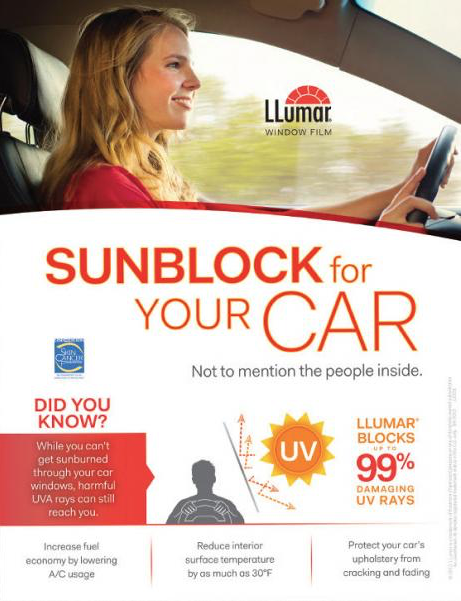 LLumar window tint acts as a "sunscreen" providing daily sun protection with a one-time application. It blocks more than 99% of harmful UV rays and offers a long-term solution to help prevent skin cancer. But not everyone prefers the look of traditional window tint. While all products in the LLumar window tint line offer UV protection, the AIR80 clear tint appeals to those who do not want the darker window appearance or where the use of dark window tint is prohibited by state laws. Use this film viewer to see how the window tint would look on your vehicle’s windows. You can't get sunburned in your car, but UVA rays can still reach you.